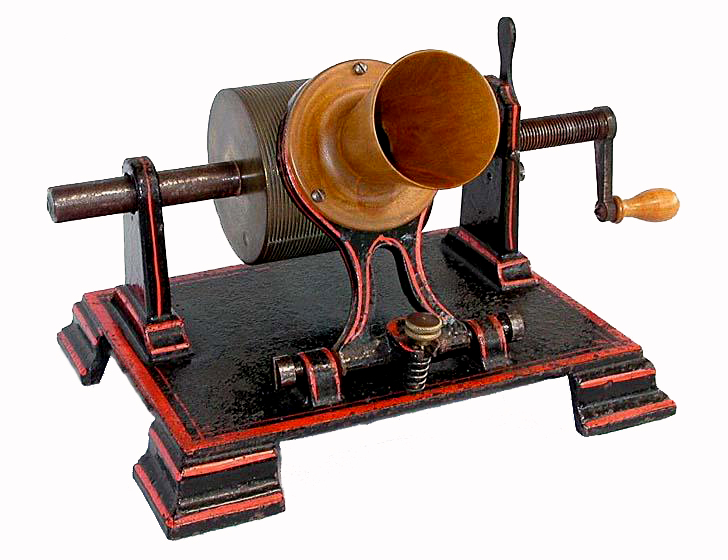 Like the Edison Parlor Model tinfoil phonograph, this diminutive machine was made as a novelty for home use rather than public exhibition. With its tiny 8" by 6" base and 2-5/8" mandrel it is at the complete opposite end of the spectrum from machines like the Kohl Exhibition Tinfoil. Despite its small size it is extremely well-made and has features found on some larger phonographs, including a slot across the mandrel to secure the ends of the foil sheet, a "throwout lever" to rapidly reset the position of the mandrel, an adjusting screw (spring-loaded in this case) to control the depth of the stylus, and a tilt-forward speaker. The mouthpiece and small horn are made of wood, and the cast iron base is beautifully decorated with red striping. About a dozen of these lovely phonographs are known to survive in museums and private collections in the U.S. and Europe.